Balancing is hard work and it changes daily based on many different external and internal shifts. Yes, it may well be that you need to build stronger ankles, or perhaps you have an injury that is impeding your balance a little, but it is also highly (and often more) affected by the amount of stress you are feeling, how tired you are, how distracted you are, and whether your breath is smooth. There are so many variables that it can be easy to give up on balancing mid-practice and just skip those postures or head for a wall (which is totally fine by the way!). However, your yoga practice is also about discipline...so give these adjustments and shapes a try during your practice to strengthen your “balancing muscle” before you seek out the wall—and certainly before you give up! This may sound like an odd suggestion, but often, the poses with both feet on the floor are prepping you for later balances. Rag Doll helps you calibrate your center. It also reminds you to grip with your toes and counterbalance your rear end with your head in any folded balances (i.e. future Crow holds and Sparrows, or even Half Moon, Warrior Three). Try swaying in your soft Rag Doll pose with both feet on the ground at the start of your practice to help you get balanced. Otherwise known as One-Legged Chair. Focus on pressing into the four corners of your foot, and if that cue isn’t working for you, then press into the inner and outer arches of your standing foot. This will help you engage the muscles in your leg. Also, try activating the toes of the lifted foot to help the hip in lifting the leg, and begin engaging the lower core muscles. Remember, the more you pull your belly in and lift your ribs up, the more engaged you are—this has the effect of balancing you with more strength in any standing balance pose. Another one of those preparatory shapes with two feet on the ground! However, this one can be pretty tricky, and requires deep attentive focus of your mind's eye. Take a strong Mountain pose with your navel pulled in so that your tailbone is tucked slightly under and your hip points reach up towards your ribs. Then, lift your ribs to to the sky and stretch your arms up until you are standing on your tippy toes squeezing your ankles. Slowly peel your gaze from out in front of you up to the sky...and hold. This version of extended mountain is a great way to train the engagement and focus it takes to stand on one leg. 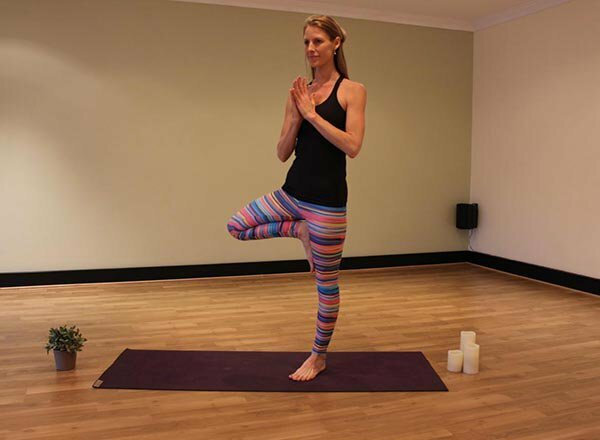 In Tree pose, press your lifted foot deeply into your thigh or calf muscle and draw the chest up to the sky. Pressing the hands into each other at heart center is another great way to remind your body of its center and find your balance. If you are still wobbly, you can lower your toes to the mat for a tripod version. 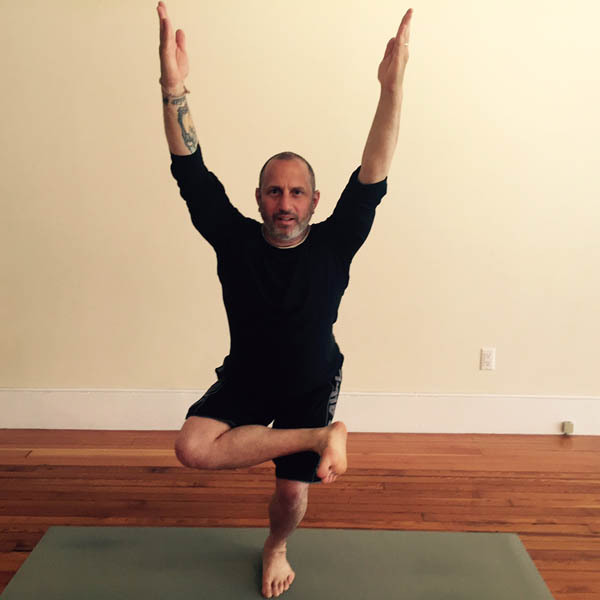 Take Eagle pose with the same toe tripod. Have the toes of the lifted foot touch the floor instead of wrapping them all the way around your standing leg. Practicing balancing here gives you all the benefits of Eagle Pose while you work on strengthening your balance. Remember your balance changes daily and is mostly about your inner focus and clarity. There are definitely some physical things that could be standing in your way, but if you are having trouble balancing, it is far more likely that you just need to breathe and give yourself time and space to concentrate and train towards it.